A declaration of independence from the zeitgeist. We visited with Rainer Brand for an article in Sternstunden magazine. 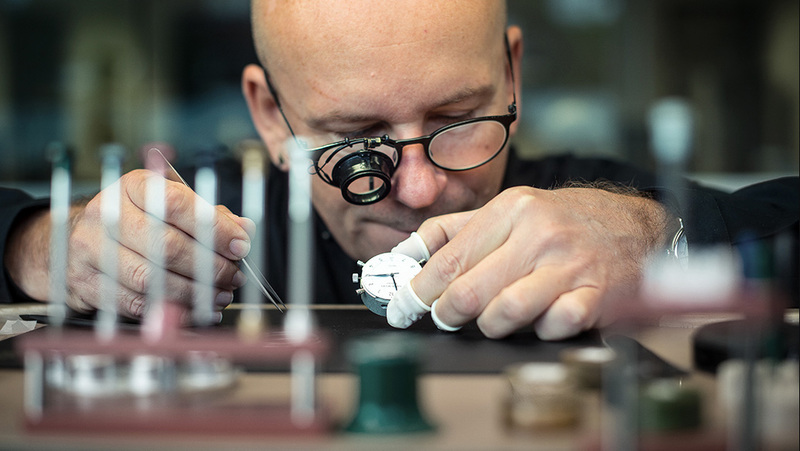 For this master watchmaker, the work in his atelier is more than simply craftsmanship – it is philosophy and art as well. A captivating and inspiring point of view. Here you can read the complete interview. For more than 25 years, Rainer Brand has been living out his dream of making superb quality wristwatches at his atelier in the village of Heimbuchenthal. The brand with the owl as emblem has long been a sought-after name for lovers of analog watches. Those who wear a Rainer Brand have made a conscious decision to do so. Each watch is an original and a declaration of independence from the zeitgeist. Let us take the time to listen in on what the watchmaker himself has to say. Sternstunden: Watchmaker – a fascinating occupation! It’s not every day that you meet someone who operates his own watch manufacture. 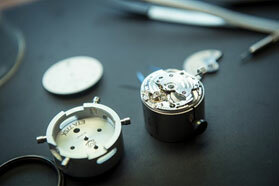 Can you tell us more about becoming a watchmaker? How did you discover your talent for this filigree form of art? Rainer Brand: One thing is certain: I always wanted to design things and work with my hands. An early goal of mine was also to eventually pursue an independent career. The enchantment of the rhythmic ticking of my grandparents’ wall clock may well be the reason why I became a watchmaker and not a goldsmith (smiling). While we are on the subject, I don’t speak of having my own watch “manufacture,” because in our industry that term means a company that makes a watch movement in its entirety. We take a different approach in our workshop. Sternstunden: Did you have a role model or some sort of mentor back then who showed you the way to the watchmaking trade? Rainer Brand: No, neither the one, nor the other. I cannot say if it was luck, or coincidence, or simply the path I was destined to follow. I left home at an early age to attend the horological school in Pforzheim followed by the master artisan academy in Schwenningen after completing years as an apprentice and my journeyman’s travels. That was rather unusual for our region at the time and the career counsellors at the state employment office advised me strongly against it. It is said that in life the right thing often happens at the right time – if you let it. And so it turned out to be. Sternstunden: How should we imagine the everyday life of a watchmaker? Rainer Brand: Good question! I have often imagined my daily routine being something quite different from what it actually is (grinning). The matter is somewhat more complex in the light of how our company not only designs, develops and assembles new watches, but also provides aftersales services for our earlier models. We inspect all individual parts and components meticulously before ever installing them into the watches. Do they have the correct dimensions, is it the proper alloy, is it the right degree of hardness, and what about the antireflective coating? Does the case have any sharp edges? You have to examine them using many of your senses – starting with your eyes and ending with your hands. After all, our watches should feel smooth and comfortable both in your hand and on your skin. In addition to the scheduled servicing and overhauls, my mind is busy ordering an entire array of thoughts. There are new models to be designed for future customers, different process methods to be tried out in production, and sources of faults and errors to be identified and eliminated. Although I work in the here and now, my thoughts are often directed well into the future. Sternstunden: Time is a precious commodity, and all the more reason to expend it in a manner that suits you best. How do you spend your free time? Rainer Brand: I always try to get the most out of my free time – especially when there is so very little of it. Winding down is easy for me when I am out with nature. My wife Petra and I have a few honeybee colonies in a meadow with fruit trees about a fifteen-minute walk away, which require regular attention a few months of the year. We also love taking long Sunday hikes through the Spessart Forest with our dog Lucy. The Spessart is so beautiful that we dedicated much of our time last year campaigning to have it designated a national park and informing people about the benefits of establishing protected areas. These efforts were only a partial success. Although it did not become Bavaria’s third national park, people are now more conscious of the forest and its status quo. Sternstunden: On closer look, there are some remarkable similarities between the watchmaking trade and managing a big corporation such as Kunzmann. The larger it is, the more diversified the divisions, departments and specialists – that’s obvious and probably the biggest difference. How is it in your atelier? Do you make each watch yourself? Rainer Brand: Our priorities are functionality and quality. And, of course, we want to offer watches that are affordable to a great many people and built to be worn – and not for your wall safe or merely as an investment. Our employees even wear watches from our workshop. And yes, we make every watch ourselves and each one passes through my hands. Of course, we do work together with specialists in their field, who produce various parts for us according to our plans and specifications. There are many very good companies within the watch industry, especially in Germany and Switzerland, which focus on contemporary developments in watch parts. Just like an automobile, a watch today must meet an entirely different set of demands than in earlier times. The outer shell must withstand a great deal more, which is why we specially harden our steel cases and treat the sapphire crystals with a hard, antireflective coating. Rainer Brand: (further) All the models in our current collection are water resistant to 10 atm – not because we expect you to go swimming with them, but because it makes the watches more robust overall. This helps make the movements less sensitive to external factors stemming from the typical way people wear watches. As a “companion through time,” today’s watches must keep pace with you, whether it be at work or recreation, and spend as little time as possible seeking shelter in your breast pocket. Equally close are our team’s relationships with our partners, who carry out research based on our wishes and drive innovative developments – such as in alloys and coatings – with an eye towards our needs. Even the special oils we use are changing more frequently in response to new challenges. It is precisely because we are a small business with short distribution channels that we can give feedback much more rapidly than big global corporate brands – something that is very important to the producers. Our family business is straightforward and manageable; the workshop and office closely linked. When six people have to do everything, everyone must do a lot. This only works when all are enjoying themselves and can contribute their ideas. The fact that we are a mixed lot is what is keeping us fit for the future. At 56 years of age, I am the oldest, while the youngest member of our company is 20. Sternstunden: What sort of people have an original Rainer Brand watch on their wrists? Rainer Brand: I can‘t give you an exact answer, because our customers come from all walks of life and span every age group. A journalist once wrote, “You buy a Rainer Brand for yourself, not for others.” That seems to be what they all have in common. The decision is each buyer’s alone to make. Although that man or woman could well afford a more renowned or sensational model of watch, they consciously choose a Rainer Brand. Perhaps they admire the design, appreciate our personal approach, or cherish the rarity that comes with a limited series together with the kind of value and longevity that only a mechanical timepiece can offer. Sternstunden: How many parts are in a Rainer Brand watch and how long does it take to make one? Rainer Brand: Sometimes developing a new model can take several years, due in part, of course, to the time just not being right for it. For a new watch we normally anticipate a production time of about one year. The time it takes to assemble all the individual parts will largely depend on the model and any “complications” with their striking special functions. A lot, of course, will also depend on the watchmaker’s mood on any given day. Let’s take the Automat s2 as an example: Here we generally need one working day to assemble 10 watches. In contrast, we have only ever built two watches a day of our “Kerala Flyback” model that is made up of nearly 200 individual parts. Sternstunden: What was the most elaborate, unusual or expensive watch you ever made? Your masterpiece, so to speak. Rainer Brand: The most sophisticated watch models of recent years were the “Flyback” chronograph and the long running “take five” with its 120-hour power reserve. Both “complications,” as such watches are called in the industry, were challenges in horological excellence. Watches can easily become much more expensive when customers request cases made of precious metals or diamonds as decoration. We also made the “Grande Panama” with a solid gold case with many women delighting in the bezel adorned with diamonds set individually by hand. Sternstunden: Mr. Brand, what do you wear on your wrist? Which watch is your personal favorite and why? And is it a Rainer Brand? Rainer Brand: I can assure you that it is a Rainer Brand. Lately, the watch I most often reach for in the morning is the “Panama automat s2” with a light dial, blued hands finished with luminous material, and accessorized with a lambskin strap and deployant clasp. I created this watch for myself and find that it embodies the ideal in cultivated understatement, simple elegance, and artful details. Sternstunden: Your website shows you sitting in front of a pencil sketch. Is that the way to your next brainchild? How and when do you get the ideas for a new model? Is it a sudden flash of inspiration? 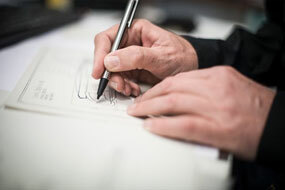 Does a long process of drafting and sketching precede them? Rainer Brand: There is a time for every purpose, and often a project will have to wait until its time has come. There are a great many requirements, insights and considerations that flow into a new model, all of which make it an exciting undertaking. Numerous flashes of inspiration and many sheets of paper are needed. Not to mention patience. Nevertheless, paper is only good for starters, as even in my 50+ generation, you cannot do anything without a PC and design software. Sternstunden: When browsing through your website, you cannot help but realize that for Rainer Brand, the work of the watchmaker is more than just a craft – it is an art form and philosophy. We find this to be a very provocative and profound perspective. Please tell us a little more about it. Rainer Brand: I addressed this question indirectly earlier in the interview, but might just add that what I would like to do is uphold tradition and give room to the future. Naturally, some people will ask themselves if mechanical timepieces are still relevant in today’s digital age. For me the answer is yes. They are a declaration of independence from the zeitgeist and created for people who cherish the exceptional things in this world. And somehow, they let us counter today’s restless lifestyle with something enduring. A charming thought. Sternstunden: Where did you get the idea for the owl as logo? Rainer Brand: It was more like the owl came to us. We were looking for a suitable trademark or inspiration. As we were letting all sorts of mythical and other creatures run through our minds, the owl kept winking at my wife. I think it’s a perfect fit, considering how the owl has all the time in the world and is often used as the symbol of knowledge and wisdom – attributes that can certainly do no harm. In mythology, the owl is one of the so-called power animals and the bearer of messages from other spheres. For me as a child of the Spessart, this bird is a valued inhabitant of the Spessart Forest, whose serene aura I really like. Sternstunden: Heimbuchenthal – a tranquil town in the beautiful Spessart where time seems to have stood still. How closely attached are you to this region and does the setting of your atelier affect your work? Rainer Brand: Town is an exaggeration. Heimbuchenthal is a tranquil little community, or more accurately a village with some two thousand inhabitants. This is the place I left as a teenager and returned to when I was thirty. The intervening years opened my eyes to the beauty and singular natural surroundings found here. It is in the forest that I find the peace and strength needed for my work. I love the smell, the sounds and the solitude you sense as you move deeper into the woods. Sternstunden: You yourself mention the connection between the restless present and the timelessness of a mechanical watch as reflecting the essentials, tradition and the tried and true. How do you position yourself as a watchmaker in such a rapidly changing world as this? Rainer Brand: Everything is changing, everything is permanently in flux – and that is normal. The market for watches is evolving, as are customer tastes. I absorb it all and let it do its work inside me. Nostalgia, vintage trends, and retro models are what dominate the watch market of today. However, that’s simply not my philosophy. As a watchmaker, I know and appreciate the history of classic watchmaking, while keeping in mind that every look back has to be followed by a step forward. It is my sincere wish that in today’s generation, the mechanical watch will find its proper place alongside the smartwatch. We, and I include young people in particular, must be able to understand and acknowledge the cultural and economic value that mechanical watches create if we are to fully enjoy the remarkable details and rare beauty of handcrafted products in general. That’s my job and what I’m striving to accomplish. Sternstunden: A similar question, but this time looking beyond tiny gear wheels at the big picture: How does a manufacture position itself alongside such global names as Rolex on the hotly contested watch market? Rainer Brand: Despite there being so many like-minded people who like similar things, there are still enough individualists out there who celebrate the different and the exceptional. Things can get rather boring when you visit a new city and see the same old stores with the same old merchandise. After all, every human being is unique. And that’s why there’s a me. Customers have written to say that for them my collection »has an unmistakable line about it«. At least they are simple and unpretentious. Still, I have to admit that for this same reason we are of no interest to certain markets in the world. And you know what? There’s nothing wrong with that. Sternstunden: What is it that makes a Rainer Brand so special? Rainer Brand: My watches are authentic and I seek reduction wherever possible to enhance the visibility of the genuine essence of the object at hand. My collection does not have to fit within a specific segment and I am completely free in this regard. I could wager to say that I design my watches for myself and not for the global marketplace. Then I look around to see if other people feel the same way and whether I’ve aroused some desire. If so, then the watches will be bought. I can afford to do this because I am not being held accountable to any shareholders. That’s a good feeling and it gives me space. My customers seem to see, feel and like that. When two people wearing a Rainer Brand happen to meet, they always get into a conversation. 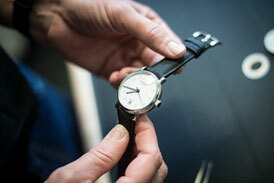 Sternstunden: You only use the finest materials – honest and authentic – for a Rainer Brand watch. The metal looks like metal, the leather like leather, and the focus is always on function. Each part is put in place precisely where it fits best to achieve the perfect product. 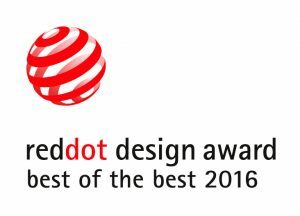 Please tell us more about the demands you place on quality and design. Rainer Brand: I’ve already mentioned this aspect in several of my previous answers. In summary let me just say that attention to detail in both thought and act is a necessity for doing a good job. Forme, harmonious interaction between quality and design is essential. Design gives format to life, adorns the individual, and interprets the wearer’s mindset. Quality is indispensable for building the brand image and is ultimately an essential prerequisite for acceptance on the market. After all, the watch on your arm has to give pleasure at every glance – not only must it be something special, but precise as well if it is to do justice to its owner. Sternstunden: Thank you for the interview and the fascinating look into your occupation.